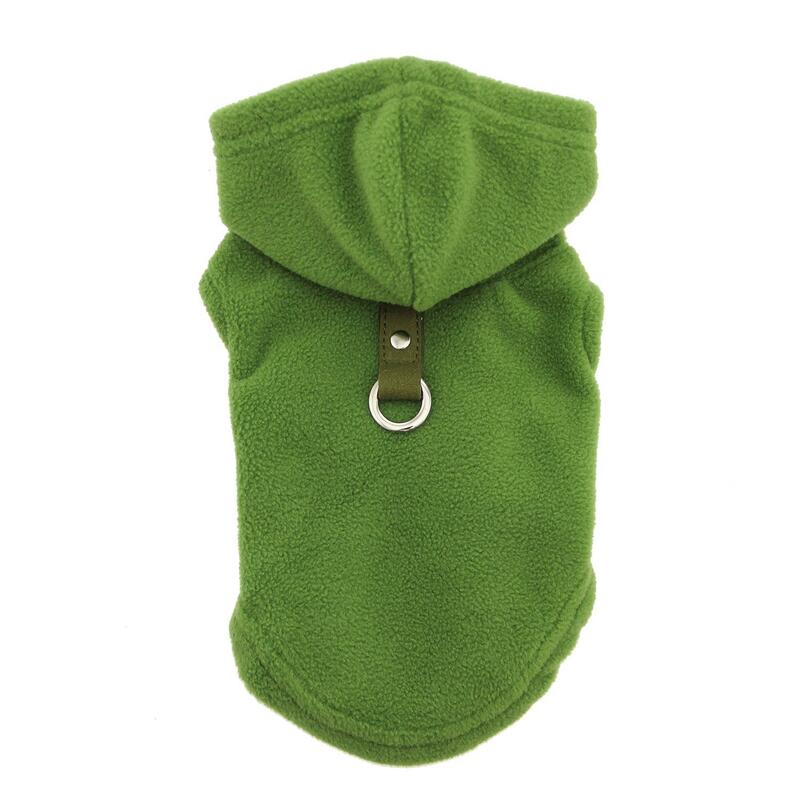 The Fleece Vest Hoodie Dog Harness by Gooby in Green is soft and warm, making your pup cozy and comfortable while providing a secure harness. 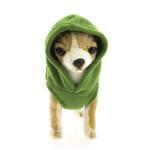 This sleeveless dog hoodie also includes an O-ring for leash attachment. The high-cut tummy keeps your pet clean and dry. This cozy pullover is a great option for chilly days when you don't want to fuss with getting a leash on under or over clothes. Just attach and go, and stay warm! The hood can be worn up or down. The sleeveless style gives your pet complete mobility. Caution - Not ideal for heavy pullers on a leash. Machine wash in warm water in gentle detergent. Line dry. Do not dry clean. Fleece Vest Hoodie Dog Harness by Gooby - Green Customer Photos - Send us your photo! Dexter likes his new Hoodie. It is soft, stretchy comfort with the D ring for his leash. The bright color helps him stand out in a crowd so he gets lots of attention. This is Divo! Divo is 3 1/2 years old and wieghs 3 lbs! He is a teacup chihuahua and lives in downtown Chicago! Divo likes to take walks with his brother Ziggy. 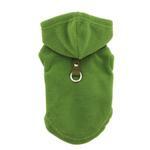 Divo is wearing this cute lime green vest from BaxterBoo and he loves it! I hate clothes but love these vests!! Posted On 02/06/18 by Lewis S from Santa Rosa, CA Yes, Lewis S recommends this product! I bought 3 for my dogs in the green & lavender shade last year. Really good quality, holds up & fits great! Go by the measurements listed. Posted On 11/22/17 by Kelly D from Des Moines, WA Yes, Kelly D recommends this product! These are great for cool weather when I don't want to use a sweater and a harness!! Posted On 10/11/17 by Eileen S from Wolcott , CT Yes, Eileen S recommends this product! I have bought a total of 5 of these fleece hoodies, and all are top notch quality. Easy on easy off, best part is the little leash ring. Get up and go! Posted On 10/05/17 by Eileen S from Wolcott , CT Yes, Eileen S recommends this product! 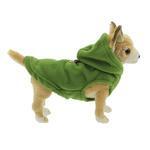 Our Teddybear loves his new little green hoodie. Good fit easy on and off. Posted On 09/10/17 by Valarie J from Springfield, VT Yes, Valarie J recommends this product! I love this Fleece Vest Hoodie Dog Harness on my Chinese Crested!!! She looks adorable in it!!! Posted On 01/23/17 by Mara G from Philadelphia, Yes, Mara G recommends this product! 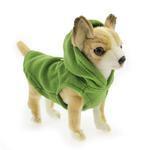 I originally bought this in purple several years ago...just got this in green in a small for my 6.5 chihuahua...it was skin tight and she is an athlete. I exchanged for the medium, which is too big, but I'm keeping it for layering in the cold. Posted On 01/12/17 by terri w from coffeeville, MS Yes, terri w recommends this product! Posted On 01/07/17 by Mara G from Philadelphia, PA Yes, Mara G recommends this product! Got this for my 6 3/4 lbs chihuahua, Rosita. So soft, but runs small; I had to exchange for a medium. Posted On 12/15/16 by sarah f from , MA Yes, sarah f recommends this product! Posted On 11/09/16 by Sydney W from Lakeland, FL Yes, Sydney W recommends this product! I bought this for our long hair chihuahua because he goes in the semi with my spouse. They travel from FL to WI so the weather is somewhat different. I love this because Cooper can wear it all the time if needed and when he needs to go out, you don't have to put a harness or collar on! Love the colors you offer and it is soft. Great for chilly days and nights! Getting the right size is always challenging for me but BaxterBoo always comes through for me! Posted On 10/12/16 by Lisa G from Lubbock, TX Yes, Lisa G recommends this product! I ordered this in a small for a 4 pound pup with a very skinny chest and waist (about a 10 inch chest and 6-7 inch waist) and it fits perfectly - it runs very long and slim so if your dog is a little thicker through the middle you might have an issue as this is not adjustable - just a pullover style. The attached d-ring is great so a separate harness is not needed. Posted On 11/21/15 by Susan G from , PA Yes, Susan G recommends this product! My younger bichipoo is wearing this sporty fleece for his fall romps and looks adorable in it. It is soft and comfortable and so far has survived his rough & tough test as he rolls on the ground, goes for walks, and races while wearing it. Best of all, the color does not show grass stains! I have a 17lb dog and I had to send back the large and get an XL! Therefore order one or two sizes bigger to be sure of the fit. New one fits perfect just shocking that such a small pup needs an XL. Posted On 03/13/15 by Jodi H from , NH Yes, Jodi H recommends this product! Cozy, comfy and functional! 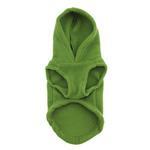 Perfect hoodie for a new puppy that likes to run and play instead of doing his business!! I bought two, one for now and the next size up - will also by buying two more for my other dogs as well. Posted On 11/19/13 by Kathleen R from Floral Park, NY Yes, Kathleen R recommends this product! Nice fabric with the added bonus of a D hook for the leash (as long as you have a dog that walks well on a leash). Just right for cool fall evenings. One suggestion hoodie tends to run small and since this does not have a Velcro bottom opening....makes it tough to put on if you buy just the right size....buy larger to save a struggle. Posted On 11/07/13 by Kimberly C from Mercer Island, WA Yes, Kimberly C recommends this product! This is a wonderful hoodie. It is well constructed and keeps my little chihuahua warm during the colder months. I've purchased multiple colors of this same hoodie and have never had any issues with them. I love the fact that Gooby includes the hook on the back of their products so I don't have to add a harness above or below the hoodie - this makes it so much easier. I did a lot of looking around online, and BaxterBoo.com seemed to have the best selection + best coupons. I'm really looking forward to receiving my order!